I get this message "You can only post 6 questions in a 24 hour period". 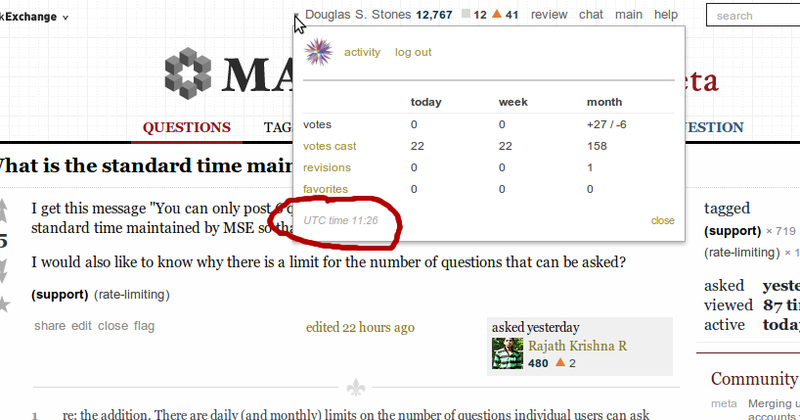 So, I would like to know the standard time maintained by MSE so that I know when I can again ask questions. I would also like to know why there is a limit for the number of questions that can be asked? I believe it's a rolling limit; it doesn't depend on any particular time zone. You can only post 6 questions in any 24-hour period. In particular, you can ask a question again 24 hours after the time you asked your 6th-most-recent question. See here: "Throttles reset 24 hours after the first post (generally speaking), not at a particular hour or anything." Note, however, that if you continue asking 6 questions in every 24-hour period you will hit the other limit, which is that you can only ask 50 questions in any period of 30 days. So be careful, and try thinking about your questions more before posting too many of them. What constitutes a day for the purposes of daily limits?